Let me make this abundantly clear– the vaccines cause autism myth has never been supported by real science even when we looked hard for evidence. I wanted to look at one of the best scientific studies to date regarding any links between autism and vaccinations, even though it’s nearly two years old. It should slam the door shut on De Niro’s ignorant commentary about vaccines, and any possibility that Wakefield ever spoke truthfully about the relationship between vaccines and autism. The research, published in the journal Vaccine, is a meta-analysis of five cohort studies involving 1,256,407 children, and five case-control studies involving 9920 children. As I’ve written before, meta-analyses form the basis, the deep foundation, of the scientific consensus, and they are the highest quality scientific evidence available. This study is like a gigantic clinical trial because it rolls up the highest quality data from those millions of subjects to develop solid conclusions. • Findings of this meta-analysis suggest that vaccinations are not associated with the development of autism or autism spectrum disorder. OR is a statistical term, odds ratio, which provides us with the chances that one property, vaccination, associated with another, in this case, autism. An odds ratio of around one, means there’s no effect, or no correlation. As the number gets larger than 1.0, then there is statistical evidence that there is an association. On the other hand, OR much less than 1.0 indicates a negative association. The findings here, most of which were substantially below 1.0, indicate that not only is there no association between autism and vaccination, but one could hypothesize that vaccination reduces the risk of autism. This is real science Robert De Niro. Robust, high quality, huge numbers evidence. This was a powerful, large, and well analyzed meta-review. It takes all of the evidence and data that had been developed previously, and rolled it up into one huge cohort and clinical trial. 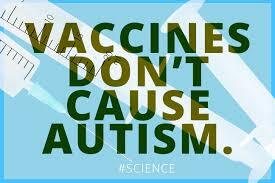 And once again, we find that vaccines don’t cause autism. This isn’t just 12 children, like what Wakefield used in his discredited and retracted research. This is a powerful epidemiological meta-review that completely refutes the link between autism and vaccinations – I hope that anyone considering not vaccinating their child sees this and understands that it’s pretty close to being all you need to know about whether there is a link. Vaccines save lives. Get your children vaccinated. Editor’s note: This article was originally published in May 2014. Because of the power of this substantial study and Robert De Niro’s tacit support of Wakefield’s fraudumentary, I decided to re-publish it with a more complete analysis of the original study. This is, without a doubt, one of the most powerful studies into a potential link between autism and vaccinations, and it says there isn’t a link.